Hardly any tool is as versatile as a sabre saw that is also called reciprocating saw. In the building trade and in renovation it is the first choice for coarse cuts, for example for shortening pipes, for cutting wood and insulation boards, shortening of porous concrete blocks and much more. Using the 1,400 Watt powerful sabre saw SSEP 1400 MVT and the smaller model SSE 1100, Metabo offers two particularly robust and powerful sabre saws with a 4 metre long cable. For the cordless construction site you can choose from three models with battery operation: Two particularly compact, handy sabre saws with different battery pack voltages and a large battery pack sabre saw, the ASE 18 LTX that belongs to Metabo's large 18 Volt cordless family. 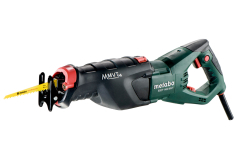 What is the special feature of Metabo sabre saws? The details. Every model is built in such a way that the user can expect best work comfort. All sabre saws have the lowest possible weight and an attractive an above all ergonomically optimal design. The aluminium gear housing of the large sabre saws is coated with plastic and the handle is equipped with a soft-grip surface for comfortable and safe handling in any working position. The tool-free saw blade change Metabo Quick is standard for all sabre saws. The saw blade can be replaced in a matter of seconds. The depth guide can be adjusted to optimally use the saw blades and permits varied applications, such as plunge cuts. 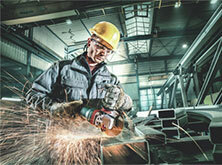 Powerful motors ensure powerful strokes and thus quick work progress. 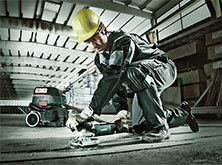 The saw blade of all Metabo sabre saws can be rotated by 180° for comfortable working over head. The best sabre saw saws only as well as the saw blade used is able to. Therefore you should also watch out for good quality here. Sabre saw blades from Metabo are ideally matched to the respective application areas so that perfect sawing results can be achieved. The saw blade range comprises over 50 different sabre saw blades and covers all relevant application areas. It is divided into different series for the different requirement profiles. 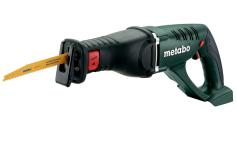 Apart from saw blades for wood and metal, special blades for sawing insulation materials, gypsum plaster, porous concrete and much more are included in the Metabo accessories' section for sabre saws.